Here’s a list of errors and what I do to fix them. Also, there’s a list of tips when dealing with these errors. What It Means: The SVN meta files were deleted/modified by your operating system or some other application and has deleted/corrupted the meta files. Solution: Run cleanup on that directory. Afterwards, run update on that directory. Move the troubling files to a temp directory. Commit whatever you can from that directory. Delete that directory. Go one directory up, and do an update (this will create clean versions of the meta files) on it. Then, from the temp directory, copy the troubling files into the folder that was recreated after you did an update. The new files will have a + sign. Add those files and then commit them. If you still see the exclamation point on it, run cleanup on the folder again. Solution: Run cleanup on that directory. Afterwards, run update on that directory. If you get a conflict afterwards, resolve the conflict or revert to the current version in the trunk. Run update again. What It Means: Your hard drive is out of space. Solution: Make more space on the drive that you’re running the update on. What It Means: The files in the folder you’re trying to commit have conflicts (most likely), and there’s repo changes you need to update your working directory to. Chances are that after you update, you’ll have conflicts and need to resolve them. What It Means: Your connection to SVN was dropped or timed out. Also, the SVN server could’ve been reset. Solution: Run cleanup on that folder and update again. What It Means: Your folder has conflicts. Solution: Go to the file(s) (in this case, e.cshtml), and resolve the conflict (or revert it if you haven’t touched it). After you do that, update the folder again. What it Means: Your metadata is not in sync with the repo and running cleanup is not helping. Solution: This is one of the most problematic issues you may come across. Updating/cleaning up/etc may not help you here. The fastest way to resolve this is to delete from repository and add the file again to the folder and commit. Sometimes no matter what you do, it won’t work, so it may be faster to redo a checkout. That always guarantees that your directory will work afterwards. To do this, delete your working directory. 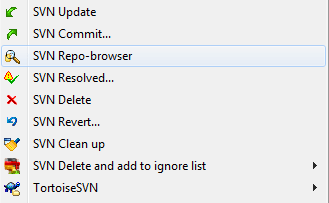 Then create that directory again and do a checkout of the folder you want from the repo. If there’s a conflict, sometimes it’s just easier to revert (if you haven’t touched it) the file to the last revision (in Tortoise, you have the option to “Revert” if there’s a conflict) then trying to resolve it. 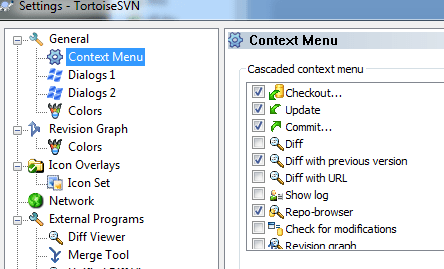 Tortoise has to update all the metadata in needed files and subfolders. Depending on how many files there are in the folder, showing the icon may take a few seconds. If you’ve waited a while and the icon doesn’t update, with your OS, navigate to the folders where the suspected files (that have an exclamation icon) are. Once you get there, wait a few seconds. Then go up 1 directory and see if that fixed it. If the above doesn’t work, run cleanup on that folder, and then do an update on that folder. What do the Icons Means?